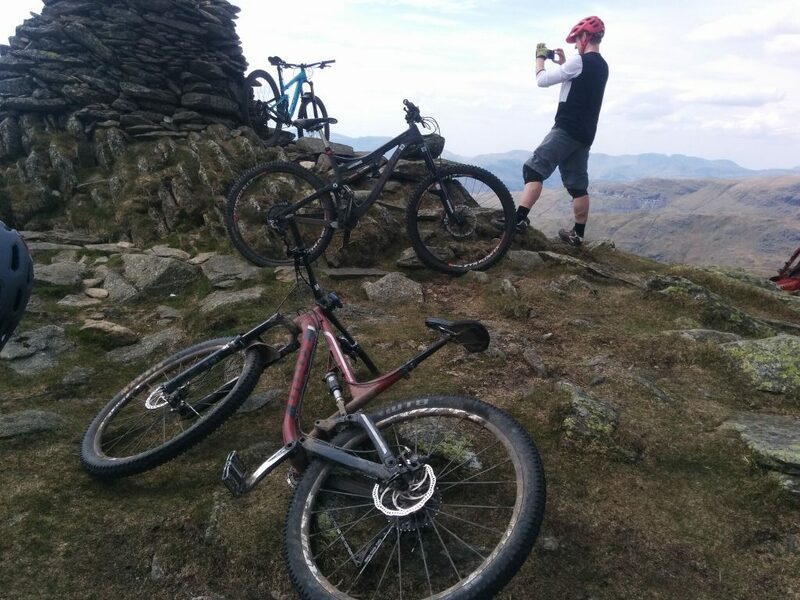 It had been dry for the best part of a fortnight when I came to arrange a ride in the Lakes last Sunday – so it seemed the perfect time to tackle a ride I’d been eyeing up for a year or so. 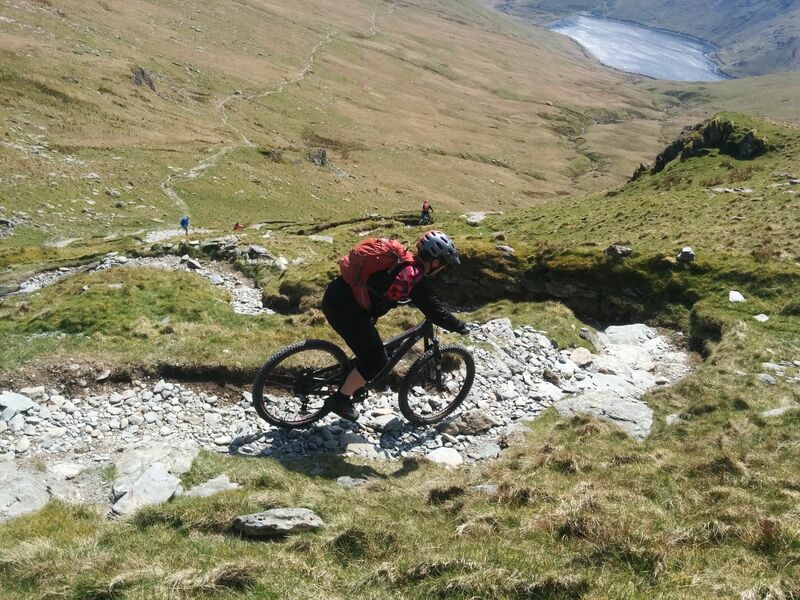 I’ve ridden the Nan Bield Pass a few times before and it’s one of the best descents I’ve had the pleasure of tackling in the UK – but I’d been told there was an interesting variation taking in the Ill Bell ridge to access it from above, instead of from Haweswater. The climbs were steep with a good dose of pushing or hike-a-bike. 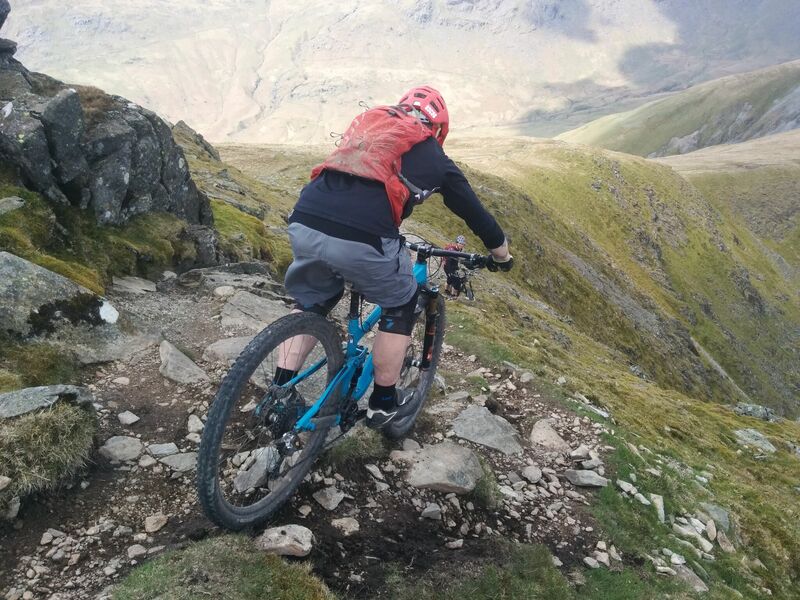 Previous illness had led me to drop out of the M&L Lakes two-dayer (taking place the same weekend) – but I wanted to tackle something with a decent amount of ascending and a bit of hike-a-bike to try to work on my fitness and to test my Kona Process 111 with a real Lakeland ride. It was hot and sunny when I met Tony and Coley at Staveley Mill Yard, quickly deciding to go short-sleeved as I wandered around stocking up on pies and cake for the ride ahead (no, I don’t have a degree in sports nutrition, why do you ask?). After a lingering virus and overdoing it a bit on a ride at Grizedale the previous evening, I was already feeling sore as we tackled the tarmac climb from Ings up towards the Garburn Pass – briefly getting into the rhythm of the ascent before the third steep section on the climb proper defeated me. We briefly remounted as the trail flattened out and we turned left from the top of the pass and continued upwards towards Yoke, but soon all three of us were off and pushing. Although it’s technically a footpath, the trail here is wide, well made and in better condition than the majority of bridleways in the Lake District – really showing up the English access laws for the nonsense that they are. With clear blue skies the views from the tops of Yoke and Ill Bell (757m) were stunning, with Kentmere to our right and about half of the Lake District visible to the left. Up to now the trail had been steep in places but mostly technically undemanding, on the descents – however that changed in a big way with the drops from Ill Bell and Froswick proving to be steep, rugged, awkward and just plain unrideable in places (for us at least). Tony dropping into a hideous arrangement of rocks. I was surprised how exposed it was up here and it’s definitely not a ride I’d want to do in bad weather. Fortunately enough of the descents were do-able to leave us laughing as we picked our way through occasional minefields of rocks, offering advice on line choice to the next rider along if we ballsed a section up. After the drop from Froswick we could see the top of the Nan Bield Pass off to the right, but we still had to climb Mardale Ill Bell ahead and traverse the hill to drop down to the head of the pass. Tony had a few goes at this before nailing it. As we gained height we departed from the main path to join a pleasant bit of singletrack countouring around the hillside to the right – with gentle ups and downs that reminded me more of upland Scotland than the Lakes. Eventually this led us to a steep, stepped descent down to the shelter at the top of Nan Bield. Unlike certain more physical Lakes step-fests (I’m looking at you Dollywaggon Pike), this one was relatively easy to ride because there were fewer square edges – the steps had been laid more like a flight of stairs. Brake issues prevented me from riding the steeper bit, but the lower half proved to be a brilliant bit of trail, leading into a more natural twisty, techy section around a haunch on the hill before arrival at the shelter. 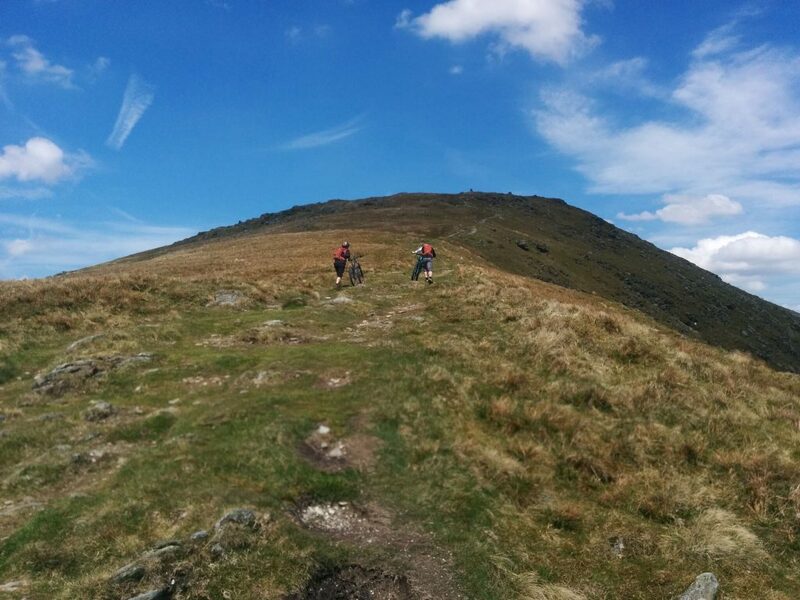 We’d already climbed more than 1,000m by this point, and probably descended more than 600m – so we were well warmed up to tackle the famous Nan Bield descent to Kentmere. 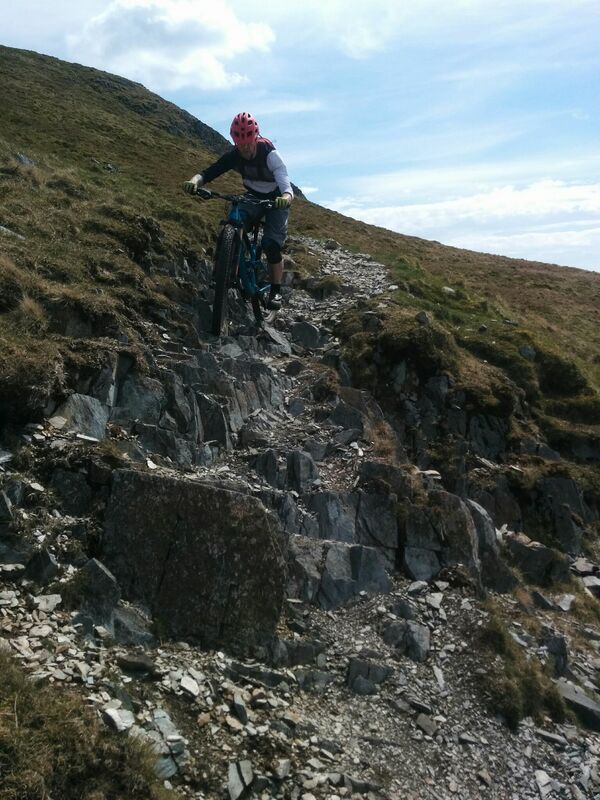 It’s not the steepest, gnarliest or highest descent in the Lakes, but it’s probably the closest in feel to the kind of techy, flowy singletrack descents that I’ve enjoyed riding in the French or Swiss Alps. Starting out with a series of rocky switchbacks as the trail snakes its way down the steeper portion of the hillside, there was just one borderline rideable bit – but I was happy to follow Coley’s enduro line to the side to rejoin as the trail straightens out and the gradient slackens off. 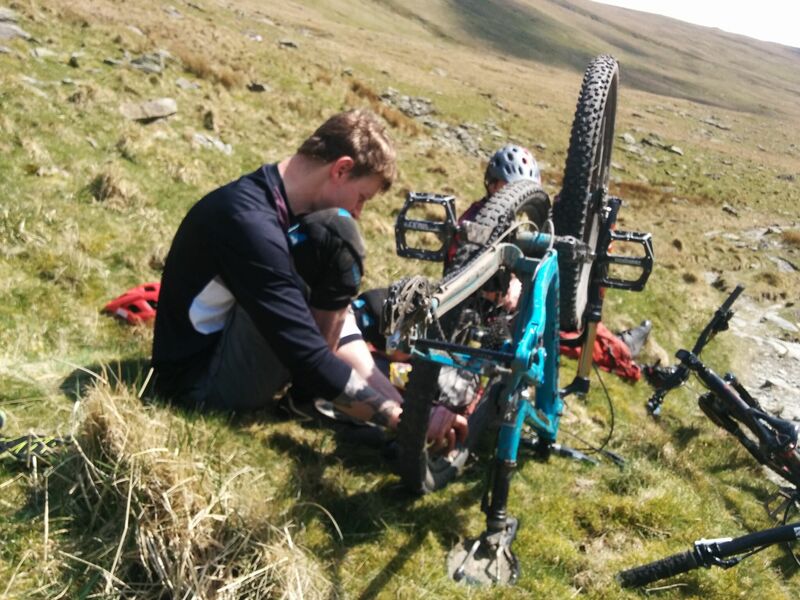 It was at this point that we caught up with Tony, who’d managed to pick up the only flat tyre of the day – which was surprising since two of us were on short-travel bikes. He sheepinshly confessed to having been riding with a paper thin XC tyre on the rear – WITH A TUBE! So I’d say his flat was fully deserved, wouldn’t you? Well what do you expect if you’re running an XC tyre and tube? Anyway, that gave us the chance to enjoy a pleasant break sitting on the grass and having a brief chat with a pair of passing bikers. I found out the next day that one of them had been using a GoPro and a mutual friend had spotted me in the footage when it was posted on Facebook. Small world. After our little intermission came the more pedally bit of the descent, which always seems to be longer and with more brief uphill bits than I remembered. Fortunately the ground was lovely and dry so even though my legs were really flagging by this point, we were able to keep a good speed up – with Tony and myself proving that this really was the kind of trail where a fun, short travel 29er can thrive – as Coley struggled to keep up with his smaller wheels. A series of gates breaks up the flow a bit at the bottom, but I was so cream-crackered by this point (I’ve not been well, remember!) that I was actually kind-of glad of the rest as we took turns in holding the gates open. We decided to add a little bonus section to the ride in the form of a climb up to the three rivers descent instead of the pedal back on the road to Staveley. Despite it being late afternoon the sun just seemed to be getting hotter and it was now that I finally ran out of water – and realised I was REALLY thirsty. Never has climbing about 120m vertical metres been such hard work! 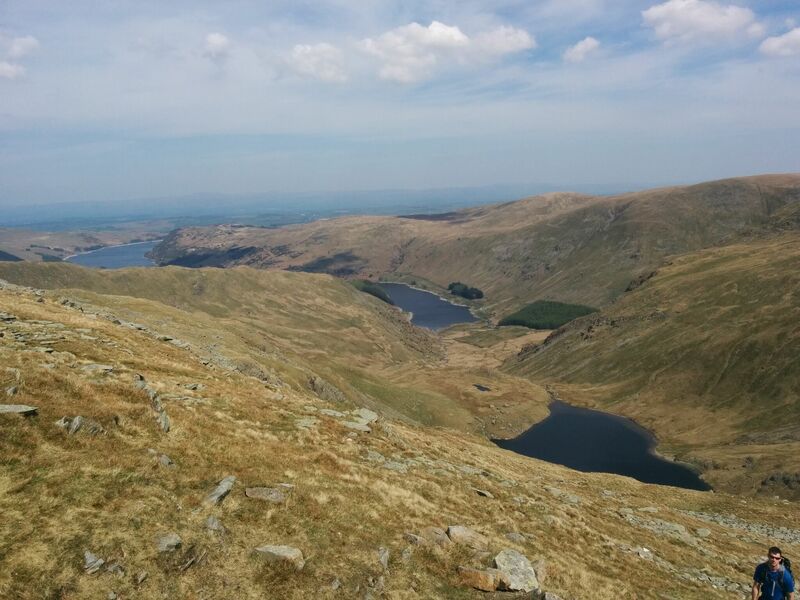 Haweswater from Mardale Ill Bell, photobombed by hiker. After sucking down one of those watery gels, we got stuck into the descent and with the gentler gradient I was able to really let go of the (dodgy) brakes on the Process and let rip – enjoying a neck-and-neck tussle with Tony on the super-fast, mildly technical descent. It was a great way to end a great ride and I celebrated by guzzling about a litre of water and scoffing an Ice Cream Mars Bar before I’d even taken my helmet off. The icing on the cake (so to speak) was discovering that the bakery in the Mill Yard was still open and that they’d stashed the pies under the counter – please don’t judge me, I don’t think I’d have made it home without one – and after a 35km, 1,360m ride in the Lakes I think I’d earned it. So in summary, a surprisingly big ride – almost an epic – with a bit of a Jekkyl and Hyde character, easy one moment and fiendishly technical the next. I’ll be back to do it again, with better brakes and more suspension.